Because of the number of stray Cats in the City of Bremen local officials have taken drastic action and decided to neuter all the cities 400+ stray cats. Only Cats who are proved to be strays will be neutered. The definition of a stray Cat being used, quite rightly in this Cat’s opinion, is a Cat who is not either microchipped or has a tattoo – both of which obviously allow lost Cats to be reunited with their human families. 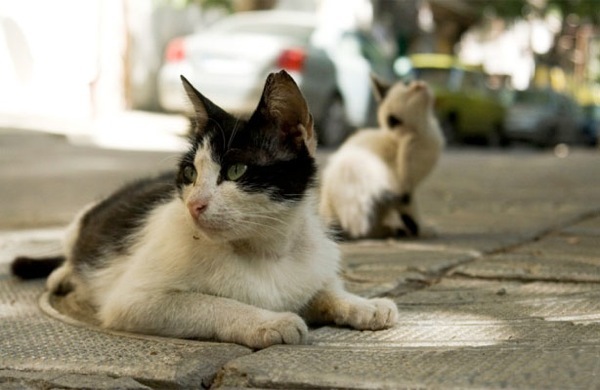 It is hoped that this innovative measure will reduce the number of stray Cats in the city meaning that horrific and usually fatal diseases that domestic Cats can catch from feral Cats will be much reduced and The Cat believes that is a very good thing. A by-product of the measure will be that the wild bird population may increase and although it would be inappropriate for The Cat to comment on this directly I did allow myself a little ‘tee hee’ at the news. So well done to the Germans they are going to create a safe, humane and managed approach to feral Cats which allows them to live out their lives the way they want to and not be put down out of hand because of course a feral Cat who is enclosed is like an animal in the Zoo something sad to watch. 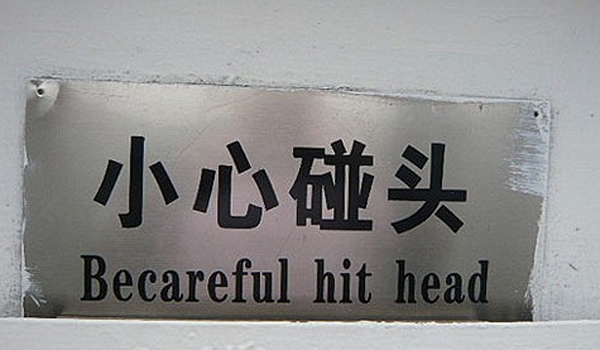 Let’s hope that more countries adopt this policy; but most importantly humans who have a Cat in the family should ensure that the Cat is microchipped, and of course the same applies to Dogs, this Cat believes that there is nothing worse than losing a family member who can’t tell others his or her home address if he or she is found by the authorities. A Small Problem With Gas! 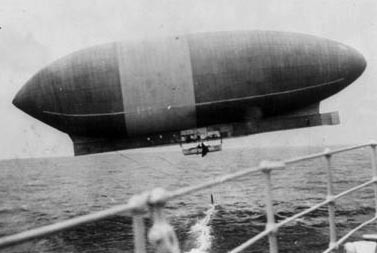 October 15 1910, the airship America slipped silently out of its hangar in Atlantic City and headed out to sea. The ‘jaunt’ across the Atlantic Ocean in an airship was the idea of wealthy journalist and adventurer Walter Wellman who previously had failed to reach the North Pole and other undiscovered destinations in the same airship America. The America’s 6 man expedition into what was the complete unknown aeronautically speaking was led by a Cat of course and sadly some still point their fingers at the innocent but rather good looking tabby Cat even to this day, but in his defence it has to be said that Kiddo the Cat hadn’t been asked to be put in charge of the expedition. And of course it was rather odd for a Cat to lead such a difficult expedition of exploration and to complicate matter further this particular Cat had only signed on for the project just before departure and had received no formal training in not only sailing in an airship, but like most Cats in anything what so ever. Cats of course in normal life don’t really need qualifications and training, they simply rely on their good looks and charm and their ability to cuddle almost anyone affectionately. Unfortunately not all of the crew agreed with Simon about Cats and the luck they can bring not only at sea and so as the airship was being towed from the coast by a tug boat, the not all that nice, Melvin Vaniman, who was the airship’s the chief engineer (and indeed probably the reason the expedition failed), secretly stuffed the poor unsuspecting Cat into a bag and attempted to lower the Cat in the bag into the tug boat or the sea which ever was the closer. However Vaniman’s attempt to jettison Kiddo the Cat failed but not before the poor Kiddo the Cat was unceremoniously dunked into the sea and then pulled back onto the America – what a way to treat a Cat! It is probably because of this behaviour that the crew decided to not only give the Cat a name “Kiddo the Cat” but also to make him Captain and let him lead the expedition, something that the rest of the crew later came to regret probably as the expedition lurched from one misadventure to the next. After 38 hours of flying the engines failed and the unfortunate America began to drift. In a moment or two of panic the crew decided to jettisoned all excess weight which in their opinion included one of the broken engines, though happily deciding not to dump the Cat or any food, both decisions the Cat heartily welcomed. To make matters worse Melvin Vaniman, the airship’s the chief engineer, mixed up the gas release tap with the tea urn handle or something similar and the crew were treated to a rapid rise upwards to over three and a half thousand feet where the temperature has been described as a “bit nippy.” This major loss of Hydrogen meant that the Airship eventually lost buoyancy and started to get alarmingly close to the surface of the ocean where if the crew were dumped in the drink they would have been not only a lot colder but a lot wetter than they wanted to be. 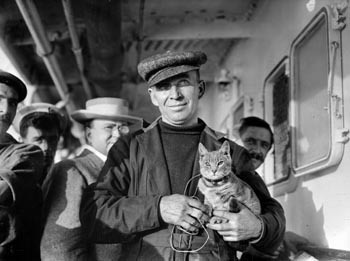 After six days of aimless drifting to and fro over the Atlantic, and having travelled a total distance of 1,370 miles (2,200 km) from the launch site in Atlantic City (a world record distance as it turned out), the Cat and crew spotted the Royal Mail Steamship Trent not far from Bermuda and reluctantly decided to abandon the America and were picked up by one of the RMS Trent’s lifeboats. Sadly the America drifted off out of sight and was never seen again although rumours abound that to this day it haunts the Atlantic disturbing Seagulls when it creeps up on them silently. 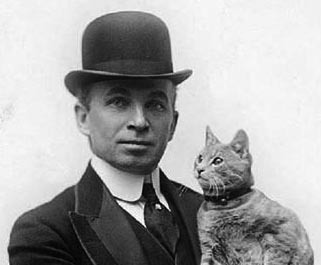 It is not known whether there was much in the way of Cat food on board the RMS Trent but the Cat became a minor celebrity with the crew and then later a much larger celebrity upon his triumphant return to the states. As is the way with these things especially when they involve Cats Melvin Vaniman the crew-mate who had at the start of their journey tried to dump the Kiddo the Cat into the Atlantic became the firmest of friends with the Cat, which just goes to show that if you take time to get to know someone or indeed ‘somecat’ before your try to drop them overboard in a bag; life could be so much easier and of course less frightening for any aforementioned felines. When Kiddo and the rest of the crew of the ill-inflated and ill-fated airship America eventually got home they were all treated like heroes especially Kiddo the Cat who was put on display in a gilded cage in the famous Gimbels department store. Fortunately Kiddo the Cat’s life became more sedate later when he went to live with Walter Wellman’s daughter, Edith and entered a dry and peaceful retirement. If any readers have any more information on this brave and well travelled “Kiddo the Cat” as he was called (especially) pictures this Cat would be delighted to upload them in his honour because no matter where we live in the world we should always honour our heroes whether they are in civilian or military life. When writing that I remembered – if you haven’t seen the marvellous movie “Taking Chance” do. It is not only a very well made movie which will make you, rightly, extremely emotional it is great and fitting tribute to the military and their sacrifices in Iraq and by association in other conflicts.